Student safety is a paramount concern for all school districts, but budget constraints often limit the resources that are able to be provided to enhance overall safety and well-being.In response to increased school shootings across the nation, this year I am sponsoring legislation that would provide school districts with additional flexibility to hire school resource officers or mental health professionals. HB 3244 would allow counties that impose a school facility tax to put a referendum question before voters to allow a portion of the funds to be used to support the hiring of support staff to assist students. Specifically, the bill allows, by referendum and the approval of local voters, more local control so that individual school districts can make staffing decisions involving school resource officers and mental health professionals that are in their students’ best interests. Last week this bill received unanimous support in the House. Today 52 of Illinois’ 102 counties have chosen to impose a school facilities tax, and the funds are limited to use only for school facility purposes. HB 3244 would amend the Counties Code to allow a portion of the school facilities tax funds to be used for the hiring of school resource officers or mental health professionals. The bill now moves to the Senate for consideration. The death of Trooper Brooke Jones-Story on Thursday, March 28 occurred on U.S. Highway 20 near Freeport, Illinois. Heavily used by cars and trucks, the multi-lane highway is patrolled by officers of the Illinois State Police. When they make traffic stops, an Illinois police officer must park by the side of the road in order to carry out all of the procedures that accompany an act of law enforcement. Tragically, two days later on Saturday, March 30, State Trooper Gerald Ellis was killed in the line of duty when his squad car was hit head-on by a wrong-way driver who was traveling eastbound in the westbound lanes on I-94 near Libertyville. An Illinois law, called “Scott’s Law” in honor of a fallen first responder, requires drivers to slow down, and if possible to move over and change lanes, whenever they see a first-responder vehicle parked by the side of the road, particularly when its lights are flashing. In the fatal incident of Thursday, March 28, Trooper Jones-Story was struck and killed by a semi-trailer truck while inspecting another semi-trailer truck. The State Police has told motorists they are stepping up enforcement of the “Scott’s Law” first-responder law. In addition, Representative Tim Butler is sponsoring HB 2417 to increase penalties for aggravated violations of the law. 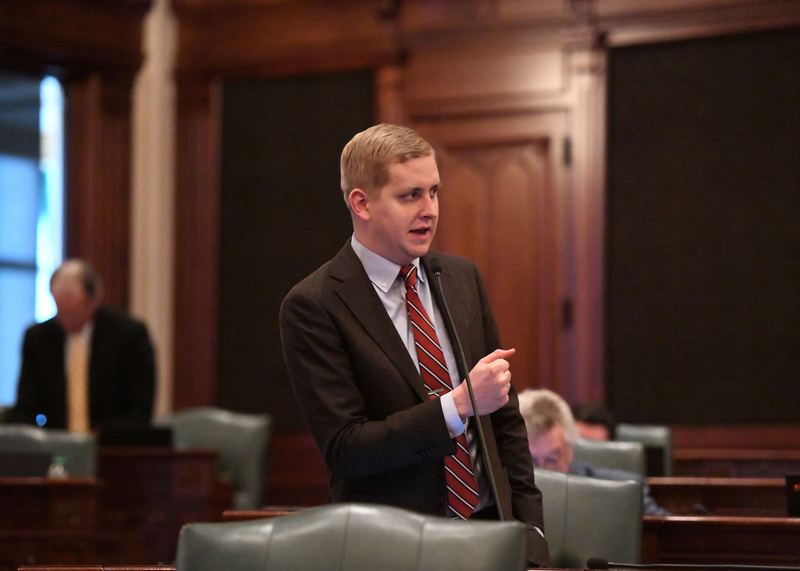 HB 2417 was approved in a House committee by a unanimous vote of 13-0-0, and is currently awaiting a final Third Reading vote in the Illinois House. I hope you’ll join me at a Town Hall Meeting I’m hosting on Tuesday, April 23 with State Senator Dave Syverson (R-Rockford) and State Representative Jeff Keicher (R-Sycamore). The event will take place from 7:00 P.M. – 8:30 P.M. at the DeKalb County Community Outreach Building, located at 2500 North Annie Glidden Road in DeKalb. The Town Hall Meeting will feature a presentation on the state budget followed by a question-and-answer period moderated by Eric Olson, General Manager of the Daily Chronicle. Attendees will be encouraged to submit questions on notecards that will be circulated throughout the presentation and discussion. I look forward to listening to constituents and providing an update on what’s happening in Springfield this year. For questions or more information about this event, please contact my Dixon office at (815) 561-3690 or visit tomdemmer.com. The REAL ID cards will maintain the ability of Illinois residents to use their State-issued ID card to enter the secure area of an airport, federal building, or military base. The cards, which will be issued to Illinois residents who apply for a license to drive or who request a non-drivers’ identification card, will comply with federal laws and rules imposed in the wake of the events of 9/11. Illinois residents who want to get the new document will be required to submit additional documentation to obtain it. The documents can be submitted at a Secretary of State driver services facility. After turning in verification documents, a typical driver will be issued a temporary, non-REAL-ID-compliant document conveying the right to drive. The verification documentation, name, and address of the applicant will be forwarded to a secure manufacturing facility for the production of a secure identification card. The card will be armed with a variety of secure features that resist counterfeiting, and will be mailed to the applicant in a blank, sealed envelope. The federal Department of Homeland Security has granted Illinois residents a transition period to continue to use their current ID cards. Existing noncompliant Illinois ID cards will continue to be usable for purposes such as airport entry until October 1, 2020. The transition from noncompliant to compliant REAL ID cards will not add a fee supplement to the existing $30 charge for Illinois drivers’ licenses. The new cards will cost the same as the old cards. However, they will take longer to get; drivers’ licenses will no longer be handed out at Secretary of State driver services facilities. Last weekend I had an opportunity to speak with WGN radio host Rick Peason of “Sunday Spin” about fiscal issues affecting the State of Illinois, and Governor JB Pritzker’s plan to remove the flat tax guarantee from the Illinois Constitution. Click here to listen to that interview. Heavy rain and snowmelt throughout the Midwest created a “pulse” of water cascading throughout many parts of Illinois, from Freeport in northern Illinois to Cairo at the state’s southern tip. While high spring water is a tradition along the banks of the Mississippi, unusual flooding on the Pecatonica and Rock Rivers has created local disaster conditions. The Illinois Emergency Management Agency (IEMA) has stepped in and has published online health and safety tips for residents and property owners affected by high waters and flood damage.